A pizza and ice cream party. Every kindergartner’s favorite. Getting older means we are expected to attend more grown up celebrations (black tie weddings, baby showers, dog naming ceremonies), but at the end of the day, all anybody reeeaaallly wants is to hit up a pizza and ice cream party. And this is coming from a high-ranking member of the tribe of lactose intolerance. So, it is with great fanfare and noisemakers that we invite you to one of the city’s best pizza and ice cream parties - a meal out at L&B Spumoni Gardens. If you’ve never been, understand that the pizza and ice cream served at L&B are a bit different from what you’re used to. First of all, let’s talk about the pizza. For all the special slices New York has to offer, you won’t often find us ranting and raving about the Sicilian. Walk into any run-of-the-mill pizzeria and chances are good that its Sicilian square pales in comparison to the standard foldable slice we New Yorkers hold so near and dear. But L&B is slanging square slices that stand up to the top triangles in town. They’re even so dedicated to the craft that they call a normal slice a “round slice.” Go ahead and walk into Joe’s sometime and order a round slice. Odds are you’ll get slapped before you get served. And unlike some of Brooklyn’s other famed pizzerias, L&B won’t make you wait three hours for your food. Pies come out of the kitchen in a normal, humane amount of time. From there, we have the ice cream, which isn’t even really ice cream, but spumoni. Spumoni is a sort of ice cream/Italian ice hybrid, with small bits of nuts and sometimes fruit mixed in. It’s lighter than Ben and Jerry’s, and a welcome change from your usual cone. Never had it? 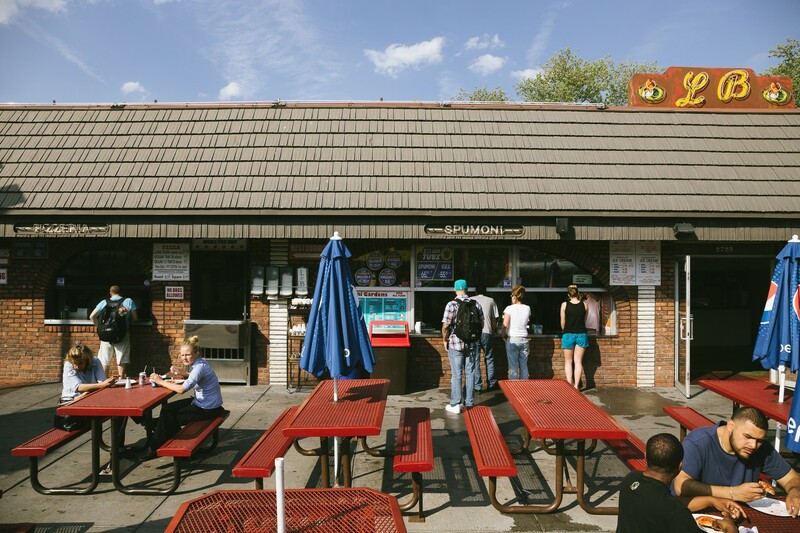 There’s no better place to make your introduction than Spumoni Gardens. Between the two of those beautiful things, the sidewalk seating here is always packed with local families on weekend afternoons and teenagers once the sun has gone down. Regardless of what time you go, or which group you happen to join, L&B will be throwing a surefire pizza and ice cream party. BYOParty hats. This slice is different than most, and not just because of its shape. The base has real chew to it, and is more doughy than your usual slice. That said, the bottom crust is crispy - often burned - so you still get some crunch in each bite. Then comes a small layer of cheese. At first blush, it can be hard to even see that there is cheese on the slice because of the thick layer of their signature sweet-but-tangy red sauce on top. And that sauce is what it’s all about. Like it or love it, this slice is different than any you’ve had. Pro tip: If you’re obsessed with crust, ask for an edge or corner slice. The guys behind the counter are happy to oblige. If your idea of pizza is something more cheese-based, go for the regular “round” slice. This looks and acts much like a slice you would get at your favorite local spot. It is perfectly legit, but pales in comparison to the uniqueness of the square. Order accordingly. If for some reason you hate pizza (and thus happiness) altogether, go for the meatball parm. Like the rest of the sandwiches here, this comes on a toasted hero roll, covered in melted cheese. Just close your eyes and dig in. Get the pistachio. Or the chocolate. Or maybe the vanilla (Cremolata). Or just listen to your heart and get the combo of all three. Done. The heart knows all. A solid substitute for anybody who can’t stomach ice cream or spumoni. Cherry is classic, but we love chocolate chip the most.